Andrew Benintendi drives in the winning run with a single to right field that scores Xander Bogaerts. BOSTON — Andrew Benintendi singled to right in the 12th inning driving in Xander Bogaerts from third for the winning run as the Boston Red Sox outlasted the Philadelphia Phillies 4-3 on Tuesday night. Mitch Moreland hit one homer and barely missed another in the 12th with a long single off the Green Monster, allowing Bogaerts to advance to third and set up Benintendi’s first career walk-off hit. The ball bounced over the short wall in right, but was officially still a single. It didn’t matter much as the Red Sox beat the Phillies in extra innings for the second straight night, extending Philadelphia’s losing streak to seven straight. 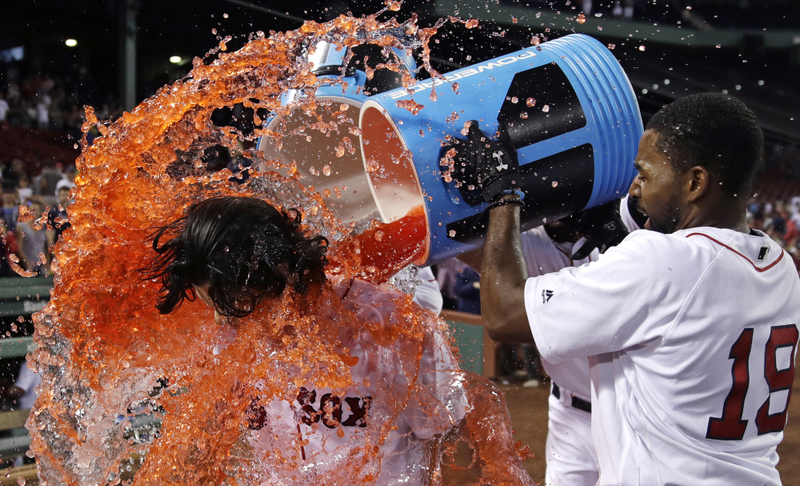 Boston left 12 runners on base and was just 2 for 12 with runners in scoring position until Benentendi finally put an end to it, then got doused with an ice bucket in front of the Boston dugout. Benintendi threw out Howie Kendrick at home as he tried to score the go-ahead run in the eighth when Maikel Franco hit a line drive off the Green Monster in left. Ben Lively pitched seven solid innings in his third career start, digging himself out of some early trouble and holding Boston to three runs and eight hits. He walked two, struck out two and hit a batter but did not allow a run after Moreland’s solo homer to center in the third put Boston up 3-2. David Price made his home debut for the Red Sox and needed just six pitches to put the Phillies down in the first. But the Phillies forced him to throw 36 pitches in the second inning when they loaded the bases with one out. The Phillies didn’t score until the third when Altherr drove a pitch from Price all the way out of the ballpark, clearing the Green Monster and signs above it to tie it at 2-all. After Moreland put Boston back up with his ninth homer of the season, Philadelphia tied it in the sixth when Michael Saunders ran out a fielder’s choice, just avoiding a double play and allowing Tommy Joseph to score. Joseph reached on a ground-rule double to right off Price with one out. The Red Sox loaded the bases with one out in the first but only got one run out of it. After walking Benintendi with the bases loaded to put Boston up 1-0, Lively got out of the early jam.